What is the Best Investment Option for 2016? It is one of the most difficult question to answer. However, let’s try to get answer of this question. The year 2015 is about to end, with a lot of hopes and happiness we will be soon entering in 2016. The year 2015 was an average year for the investors. Equity, Gold and real estate most promising investment options were unable to perform in 2015. Sensex generated returns of -7.16% this year. Except few midcap and small cap stocks majority of stock were an underperformer in 2015. Gold is also in the list of a negative performer of 2015. Gold generated returns of -3.8% this year. Real estate sector is also silent, and very few new transaction in real estate is noted. It is estimated that overall real estate has also given negative returns by around 5% in 2015. 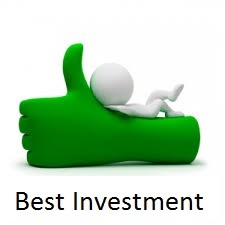 Only fixed return instruments were able to give positive returns to the investor. So, is it the time to look at fixed return investment option? Before jumping on any conclusion let’s try to look at historical performance of all asset classes. Equity is one of the best assets of making an investment. 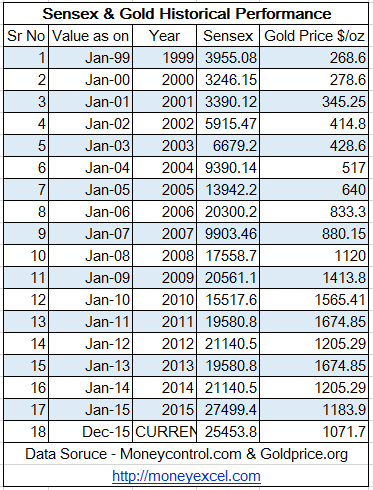 I have complied historical performance of equity starting from the year 1999 till date. 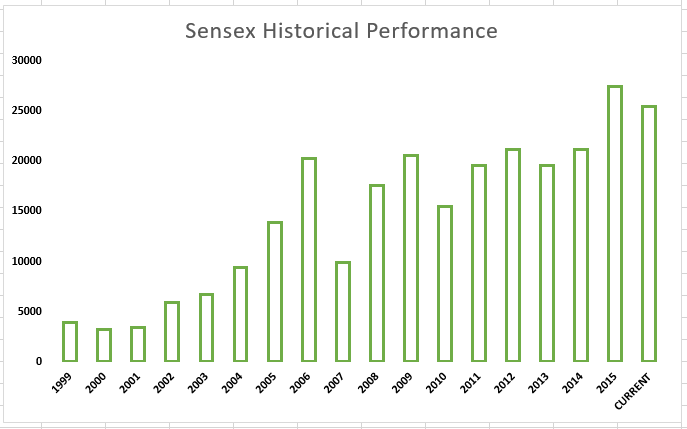 If you carefully observe the performance of sensex over several years you will come to know that YOY sensex is generating more positive return and less negative returns. In last 17 years sensex gave negative return only 5 times. It is also expected that sensex will deliver similar performance in future. Current fall in stock market seems to be temporary in nature. We will soon see upward movement in sensex. Gold is another asset class where a majority of investor intends to invest the money. Historically gold is also one of the top performers. From the year, 1999 to 2011 gold was a consistent performer and was giving constant positive returns. Gold price is falling since last 5 years. It seems gold is overvalued today and we may see a correction in gold price. Historically real estate is also performing well and lot of investors are making an investment in real estate. But, unfortunately, data for compiling historical performance is not available. Real estate sector is not performing well since past few years. Upcoming smart city project and real estate bill may give major relief to real estate sector and we may see positive move for the real estate sector in 2016. After looking at historical performance, if you want to rank all investment options in chronological order Equity will be on Top on the chart. So, best investment option as per me for 2016 will be equity. If you don’t know stock market investment you can opt for mutual funds route. In order to help you, I have also complied 20 Best Mutual Funds for 2016. So, Stay invested in equity and buy good stocks on correction. You will defiantly gain an advantage at a long run. So, which is Best Investment Options for 2016 as per you? Do submit your opinion in the poll given below. From the Table “Sensex & Gold Historical Performance”, please review the Sensex & Gold returns of Year 2011 with 2013 and 2012 with 2014. Both Sensex & Gold returns are the same? I have voted for stock markets with equity mutual funds in mind.. would suggest mutual funds when compared to stocks any time.